Last Update: April 24, 2019, 10:07 a.m. Cleaning your wheels and tires regularly is not just an appearance issue – it’s preventative maintenance! Cleaning your wheels is important, especially for polished, glossy, or chrome finishes. If not properly cleaned, heat from the sun or your vehicle's brakes can eventually bake contaminants into the finish on your wheels, making it difficult or impossible to clean them. Treat your wheels as you would treat your vehicle's paint. Clean one wheel at a time, using a mild soap with water and a soft sponge or cloth to gently scrub away dirt and brake dust. Rinse immediately with clean water and dry with a soft cloth to avoid dried soap or water spots. If desired, apply a wax to to help repel water and contaminants. We carry or can order wheel cleaner and wax for your wheels. Never use chemicals cleaners, degreasers, or abrasives to clean your wheels; they will only damage the finish. Avoid automatic car-washes; the finish on your wheels could be damaged by rough brushes, metal guide rails, or pressure washing. Spray on the cleaner of your choice and let it dwell on the metal wheels and rubber tires. Check the cleaner instructions to see how long the manufacturer recommends the cleaner sit on the wheel surface. After the cleaner dwells, use your cleaning brushes to scrub the surface of the wheel and tire. Your brushes will work better when they're wet. Wet your brushes in a bucket of water and auto shampoo. Start with the inside of the wheel: scrub the inner barrel of the wheel, the wheel hub and brake caliper first before moving to the spokes and outer surfaces. Brush the inside of the wheel well too. Use a nylon brush to scrub the rubber tire. After scrubbing with your brushes, rinse the wheel and wheel well with a pressure washer and clean water. Dry with an air dryer for a spotless finish. Coat your wheels with a sealant or nano coating [optional]. Finish your tires with a rubber dressing. Wheels are your vehicle's jewelry, and can be quite expensive. Care for them the proper way and they will always look their best. 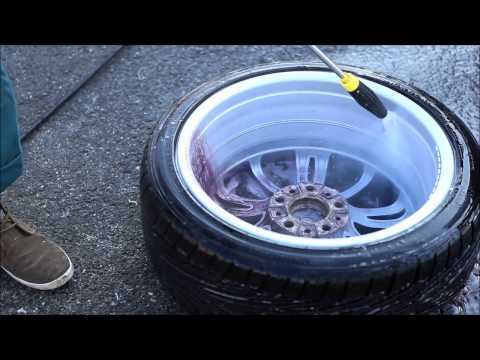 Here are some tips on how to clean your tires and wheels. How to clean your wheels. Basic how-to guide on cleaning wheels.